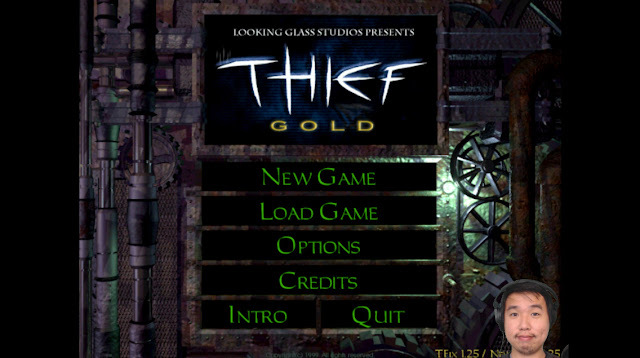 This week I finished streaming through all 15 official missions of Thief 1 (Gold edition) as part of my "Level With Me" project, where I play through games and talk about the level design and environment art in them. In my runs, I usually try to imagine how a first-time player approaches the level, while occasionally demonstrating more "advanced" tactics --and then frequently messing up and alerting a dozen guards. For the first time since 2014, the #7dfps challenge is starting tomorrow. If you're not familiar, it's a week-long jam to make a first person game that tries to do something new. Past alumni of 7DFPS include high-concept gun games like the original Superhot prototype as well as Receiver, but of course you don't have to do any shooting or violence for your first person game. Make a first person whatever-you-want. If you need help getting started with making a first person game, even if you've never made an FPS or even a video game before, then here's a great free step-by-step tutorial with video examples on KO-OP Mode's "Make Weird Stuff in Unity" workshop page. This year, 7DFPS also falls on the same week as PROCJAM, a community jam to make something that makes something (procedural generation)... they have their own list of talks, tutorials, and resources to help you make a proc gen thing. Maybe this is a good time to make that procedurally generated first person game you've been dreaming about it? It seems the gods will it so. GDC season is coming up soon. If you have any interest in level design and you have something to say about it, then please submit a proposal to the Level Design Workshop mini-track at GDC 2019. Although it is supervised by AAA developers with a level design background, like Clint Hocking or Joel Burgess or Lisa Brown, you don't have to be a AAA developer -- hell, they even let me give a couple talks in past years, and I'm just some kind of vaguely-leftist pseudo-academic weirdo? Again: indie, modder, altgames, etc. folks of all backgrounds are all welcome and encouraged to submit, as long as there's some relevance to environmental world design for any game genre. I don't look at the submissions, but I know the committee truly does want to highlight any new voices and new approaches to level design. Submit a proposal within the next two weeks, by November 2nd. Good luck! 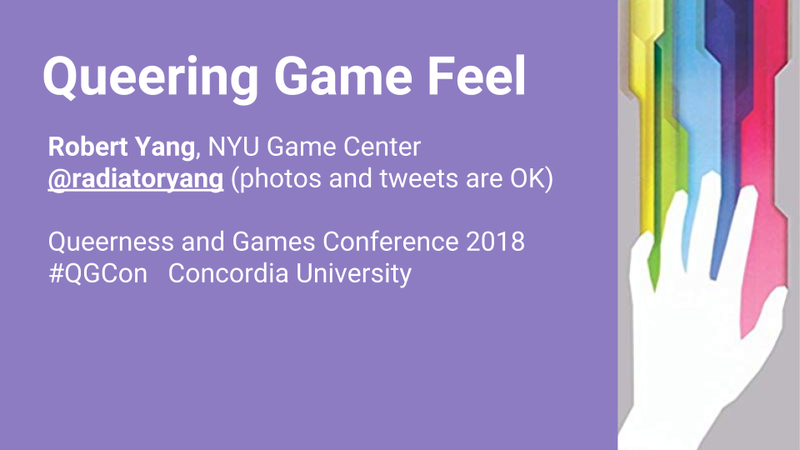 This post is adapted from a talk I gave at Queerness and Games Conference 2018. Game feel is most known through indie game developer Steve Swink, who wrote an influential article and a book about it. While I like Swink's book and methodology, I also think it limits itself to a very narrow subset of games and feels -- focusing heavily on platformer action games, but never really thinking about the game feel of strategy games, interactive fiction, or dating simulators, etc. There's a lot of pages on the input curve in Super Mario Bros, or the camera feel in Gears of War, or the animation in Symphony of the Night, but it omits something like The Graveyard or World of Warcraft. Do those games not have game feel? 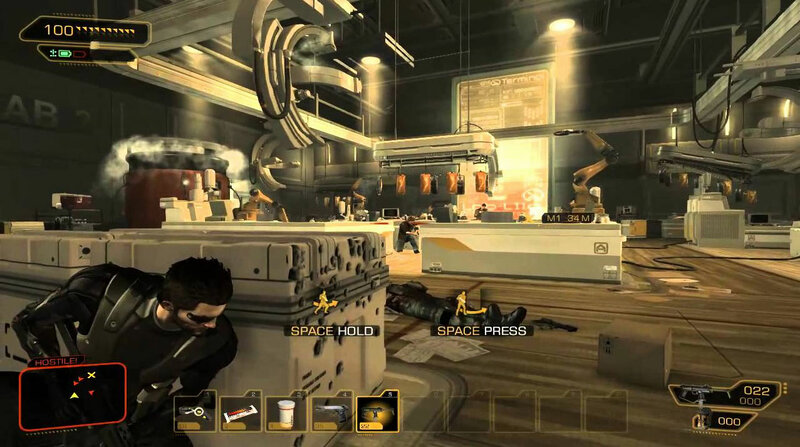 Claiming these other genres and games under the banner of game feel might've weakened Swink's argument for closely coupled cybernetic loops and virtuosic traversal across game worlds back in 2008. But now ten years later, I think the time is right to expand game feel's concerns.